You Be The Judge | Case 01: The Ice Bag | How Will You Rule? 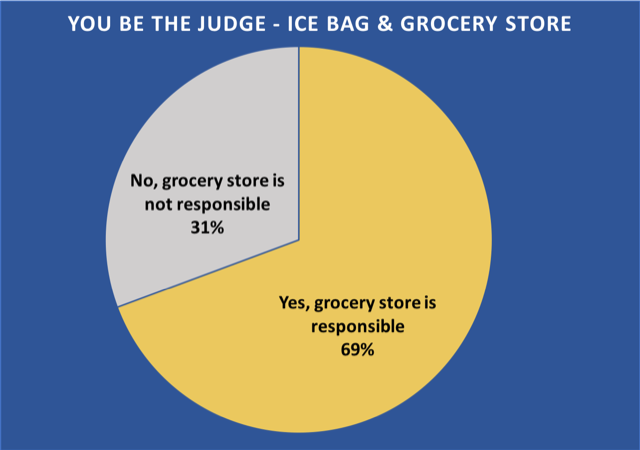 We surveyed 600 people about an incident involving an ice bag, a grocery store, and a woman who got injured slipping and falling. Is the grocery store responsible for the injuries of customer #2 who slipped and fell on their property? Here are the results of our initial survey of 600 people when given the basic facts of the case. Now armed with video surveillance and lawyer arguments, what say you? On the in-store surveillance camera, customer #1 is seen making a payment, then grabbing an ice bag from the freezer located in front of the store, and walking out of the store entrance. Customer #2 immediately thereafter also completes her payment at the cashier, and walks the same path as customer #1 for the same entrance but slips and falls on water located on the floor, and sustains serious injuries requiring knee surgery. The Ice bag taken by customer #1 had a small tear and was leaking causing a slip and fall hazard. 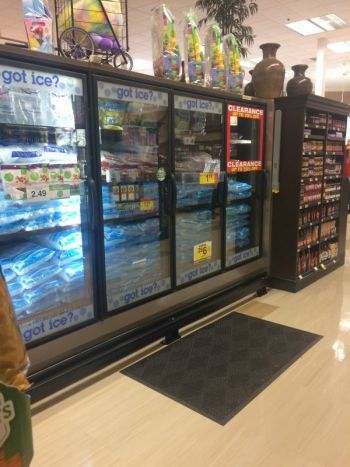 The store admits that it is aware that ice bags on occasion have small tears causing water to leak out of the ice bag. The store has an inadequate safety inspection policy to prevent such slip and fall accidents. The store inspects the entire store every hour on the hour in order to locate any potential spills to try and prevent customers from slipping and falling on anything, including ice and liquids in the store. A safety inspection each hour is not sufficient to guard as water spills from torn ice bags. 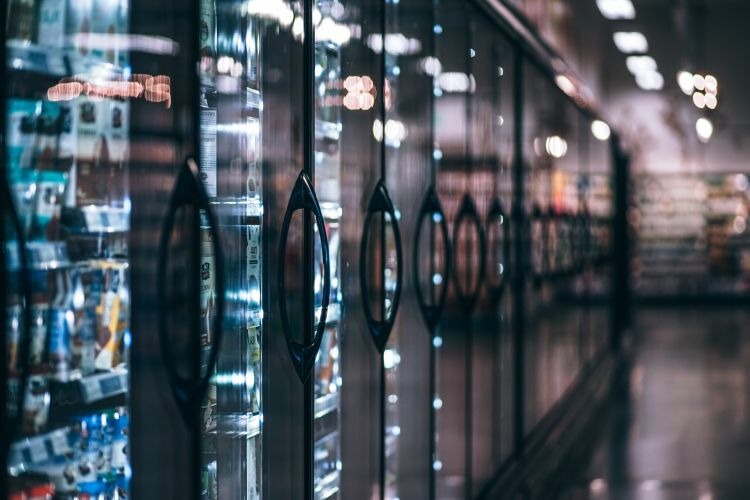 Relying on an inspection policy that only happens once per hour is not a guarantee, and is equivalent to playing “Russian Roulette” where some people will be lucky and other unlucky, all depending on the timing of the store inspection and spill cleanups. If an ice bag with a small tear causing a leak is taken out of the ice box and walked out by a customer and it’s 20 minutes until the next inspection, and no one catches the water spill in time, a slip and fall can occur. Include additional plastic bags similar to what they provide for in the flower section where you can place wet flowers in a small bag to prevent water spillage. Provide a lock on the ice freezer, and upon purchase, have the store clerk remove ice back and place it in a bag to give to the customer. Have the ice freezer outside with a clerk removing ice for handoff to customer. The Additional safety steps listed above should have been followed but were ignored, and the store is responsible for the injuries customer #2 sustained and should be required to pay to bring justice in this case. We have an inspection policy – we inspect the store every hour on the hour, with a person who walks the floors and we make sure that nothing spills or needs to be cleaned. This is a reasonable policy to prevent slip and fall accidents. The spill was not from the ice bag but a spill caused by the ice cream from Customer #2’s child – the child had walked ahead of Customer #2 moments before and caused the spill. You’ve been preesnted with the evidence, now it’s time to decide. Do you agree that the grocery store should be held responsible for the injuries sustained by Customer #2 after the slip and fall accident? Why or why not? Click here to take the survey above! Join us again for another case on You Be The Judge, brought to you by The Law Offices of David Azizi.